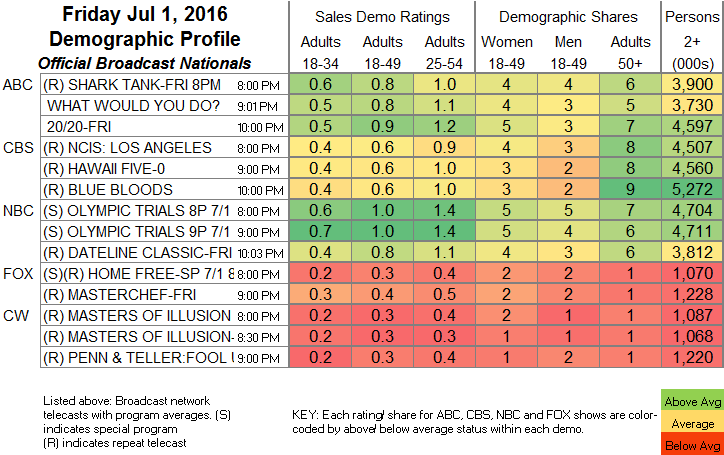 NETWORK FINALS: The only change from preliminary numbers was a 0.1 drop for the HOME FREE rerun. CABLE HIGHLIGHTS: It was the start of a slow holiday weekend for cable, but SHARK WEEK still performed for Discovery, with SHARK BAIT at 0.59 and BLUE SERENGETI at 0.51. Syfy strategized that the quiet would be a good time for some season premieres, and KILLJOYS opened at 0.24, down 0.02 from the 2015 premiere and up 0.01 from the season finale, with DARK MATTER at 0.20, down 0.11 from last year’s series premiere, but only 0.02 from its 2d airing (the first time it had KILLJOYS as a lead-in). Both shows were considerably ahead of last week’s season finale of WYONNA EARP and its 0.14. On Adult Swim, BRETT GELMAN DINNER IN AMERICA had a tasty 0.40. ESPN’s coverage of the Wales vs. Belgium EURO 2016 match was at 0.45. On HBO, REAL TIME WITH BILL MAHER lost 0.03 to 0.34, while VICE dropped a tenth to 0.12. Food Network’s DINERS, DRIVE-INS & DIVES returned at 0.27. A NASCAR race on NBC Sports Net was at 0.25. Note that while Spike listed all of its marathon COPS episodes as originals, taking over a fair amount of the chart, they were likely reruns. OWN’s LOVE THY NEIGHBOR was at 0.18/0.17. 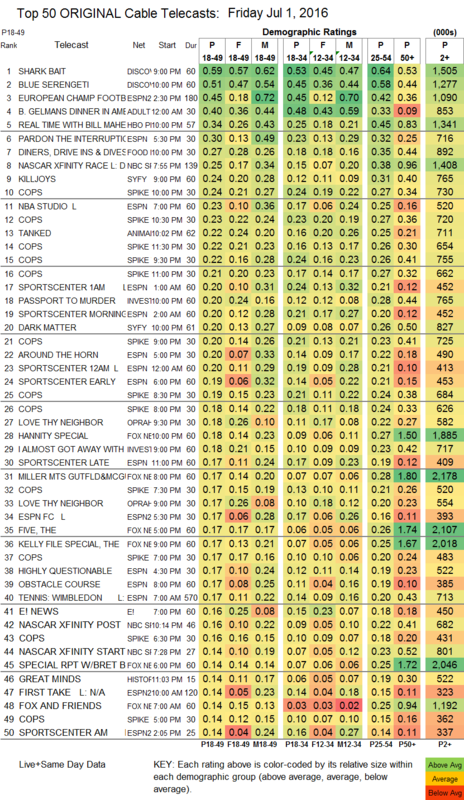 IFC’s COMEDY BANG BANG was up 0.02 in its 1st episode at 0.05/96K and steady at 0.03/68K in its 2d.